On entering the office, we don’t stuff our B2C brains into the desk drawer, replacing them with pin-striped B2B versions allocated to us by HR. If that deathly dull and overly formal white paper would put me to sleep as a B2C reader, it’s not suddenly going to find me more attentive because the clock is somewhere between 9 and 5. Of course, there are some differences between B2C and B2B marketing – multiple stakeholders for one – but on an individual level, the two have far more in common than not. Social media has broadened the scope of so-called professional conversations, allowing people to discuss topics and share content once confined to the personal realm. “We talk about so many more things,” says Claire Austin, content marketing evangelist for LinkedIn Australia. “There’s no way my parents would’ve discussed things like mindfulness, the psychological effects of working, or the challenge of going back to work after childbirth. These were just things you just got on with and no one spoke about (in the workplace). Whereas now, these are things that we do need to speak about and we’re happy to speak about them. LinkedIn has long been seen as the formal pinstripe suit to Facebook’s Hawaiian shirt. According to the Content Marketing Institute’s latest B2B benchmark report for North America, 92% of B2B marketers use social media for content distribution, a rate just below email usage (93%). And LinkedIn commands a massive 97% of B2B marketers who take social media action, almost double the number reported in 2010. LinkedIn may have started as a way to find career opportunities via job listings and networking, but that’s not why people return regularly these days. Today, visitors view content on LinkedIn seven times more often than job listings. It’s not hard to see why. 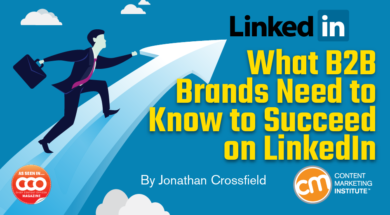 LinkedIn has steadily evolved into a content platform, acquiring and integrating other content services such as news aggregator Pulse, presentation platform SlideShare, and online learning company Lynda. In whose content do we trust? The 2017 Edelman Trust Barometer report reveals that 62% of people trust a brand’s social media more than its advertising. And Business Insider’s Digital Trust Report found LinkedIn is far more trusted by users than either Facebook or Twitter. But not every person speaking on behalf of a brand is equally trusted, even on LinkedIn. According to the Edelman report, people trust information and advice given to them by an employee of a company significantly more than they do from the CEO. And people trust people who are “like them” even more than company people. It is the individual rather than the faceless brand who carries more authority, particularly if people can relate to them. While most B2B marketers are using LinkedIn, some still use it as an occasional strategy when time, budget, and resources allow, or when there is a big campaign or product launch. “It’s more crucial than ever to be ‘always on.’ Pretty much any B2B buyer (will consume) 10 pieces of content during that purchase process,” says Austin. “So, if you want to be in that consideration set and you want to be part of the 10 pieces of content, you need to be visible at all times. The brands that are flourishing and doing really well – getting the best return on investment and the best performance from their campaigns – are those that have this ‘always-on’ strategy. While B2B marketers spend a lot of time publishing and sharing content on LinkedIn to build a following, most eventually want the audience to follow a link to the website or wherever the lead might be captured or conversion might happen. Austin explains that people typically consume at least three to four pieces of content before clicking to engage with a brand on its platform. She continues, “Expecting people to immediately go and sign up to your newsletter and then download something is quite narrow-minded. This is where we need to get more creative with the content that we’re doing on LinkedIn. A version of this article originally appeared in the February issue of Chief Content Officer. Sign up to receive your free digital subscription.